I teach meditation and mindfulness. I also make media (writing, audio, video) for non-profits, museums, publishers, and good people. I am not the David Hart in New York who makes ties, but he seems nice, I guess. I teach meditation and mindfulness for youth and adults. My clients include creative agencies, law firms, financial services agencies, schools, and hospitals. I'm interested in helping people develop more attention as well as understanding and connection to themselves and the world. 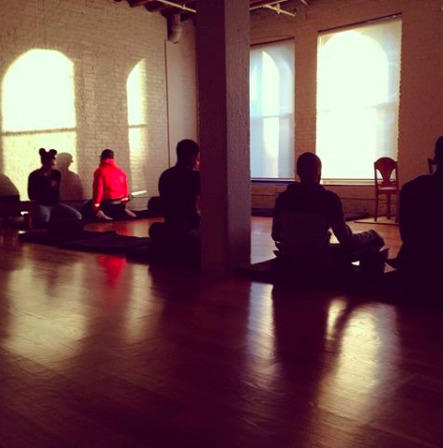 I teach onsite meditation for companies, primarily through Journey Meditation. I volunteer and teach with other school and afterschool programs within New York including the Awake Youth Project. The Pop Culture Salvage Expeditions is an ongoing podcast that uses the lessons of pop culture for making artistic activism more effective. I've edited episodes for the series. I also help write and edit content for the Awaken meditation app. I shoot and edit video, including online courses for teachers. Recent example include a trailer for the Wisdom Publications online portal and an online course for The National Gallery of Art. I pioneered the video program at The Museum of Modern Art, including this important teaser video with my cat. Occasionally I write things like greeting cards (seriously) or short humor pieces on sites like McSweeney's. Please don't ask me to come up with taglines for your app. My background is in education and training, art, and mindfulness. I've had a lot of jobs. You may recognize me from Google Maps in France with my wonderful wife. Or that other time I was on Google Maps in New York. (No, I was not flipping the bird—grow up). This form is only for direct responses to your inquiry. Your email and information will not be added to any mailing lists, sold, or transferred.